I’m presently in Bali for business and pleasure. I’ve taken up surfing, and the challenge and difficulty reminds me of the learning and teaching process for mastering music skills. I almost talked myself out of it. Am I getting a bit old for this? 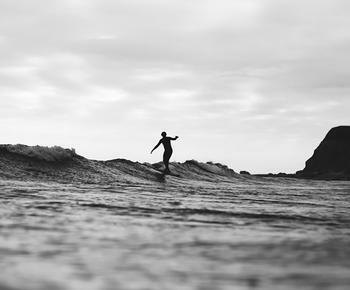 Isn’t surfing for younger, more agile people? It’s easy to run through a range of excuses before trying a new activity. Many middle-aged adults forego learning new skills such as playing an instrument, picking up a language, or dancing, instead preferring to stick with well-ingrained activities that were assimilated during their formative years. Without making the attempt, some mature adults assume they lack the capacity to learn new things. Yet learning is the best way to keep the brain healthy. From my surfing experience, this was the first of many lessons. Lesson #1: Learn new things! It’s great fun, and good for both the soul and the brain! On my first day surfing, I decided I would teach myself, and thus spent 90 minutes flailing (and failing), bemoaning my lack of balance, strength, and reaction time. In every area required to succeed as a surfer, I was coming up short. I considered giving up. Clearly, I didn’t have the skills. >Lesson #2: We often give up on challenges too quickly, before having exhausted all avenues for improvement. For some reason, we expect skills to just show up, without going through the process of developing them. But failure is more likely to derail our efforts and perseverance when we attribute our limitations to a lack of natural disposition, rather than adopt the view that skills are acquired with effort, over time. What’s more, I nearly succumbed to the allure of that vague and insubstantial copout: “You tried and did the best you could.” People who take this stance give themselves permission to stop trying and almost always underachieve. I reflected on my sagging surfer self-efficacy. You see, I’m trying to live more of my life as a “growth mindset” practitioner. I am convinced that achievement is determined by the quality and quantity of one’s effort rather than any alleged natural disposition. Ironically, the business component of my trip had me instructing teachers about the educational impact of different mindsets. I really should walk the talk, I told myself. So it was with renewed determination not to give up (or not just yet, at least) I booked a surf lesson for the following day. My initial response to being such a lousy surfer after day one took me by surprise. I meet so many people who want to sing or play music but say they can’t, and yet never consider taking lessons or practicing as a means of improving. But here I was, embarking on my first two-hour surfing lesson. The theory part began on dry land. My instructor, Putra, was to teach me the sequence of events required to stand while balanced on a moving surf board. Essentially this meant learning 1) body placement lying on the board, 2) hand paddling position, 3) pushing up with hands under chest, 4) proper feet positioning, and 5) body crouch technique and weight transfer. Putra asked me to watch his demonstration closely. Rather than verbalize, he modeled slowly, in defined “chunks.” He repeated the same movement several times before inviting me to copy him. When I got it right, he had me repeat the action several times before continuing on to the next. When rising to a standing position there is no time to think about mechanics or technique. This might ring true to music teachers, as virtuosic music demands some of the most skillful, coordinated sequences of movements available to humans, requiring repetition to automate physical actions. In music, most learners stop repeating a target phrase when they get it right the first time. They should actually repeat it significantly more often, however, as this strengthens the neural circuitry assigned to the skill set, enhancing automatic recall. Lesson #3: Whether it’s surfing, music, or any coordinated skill, the fundamentals of teaching and learning are the same. Time to surf! On my first three attempts, I fell off before I’d managed to stand up on the board. Enter the value of quality feedback. Very literally, I needed to know why I was incompetent. Putra’s comments were helpfully specific. Putra didn’t tell me “that was great” or “not right.” Such comments are ineffective because they provide little or no information on correct and incorrect learning processes. This is one of the problems with praise. People think it encourages, but most praise achieves little because of the lack of specific feedback. Lesson #4: To make progress, learners require clear, accurate, consistent, and timely feedback. After my third disaster, I didn’t fall off at that stand-up stage for the remainder of the lesson. I’d gotten the hang of it! I did fall off in the process of riding the wave, however, as I experimented with turning and shifting my weight. But my progress was visible, and my confidence grew. Eventually I was riding small waves to the beach. So much fun! No wonder progress is the great motivator. Incremental improvement is a truly wonderful feeling. Lesson #5: We all have the capacity to learn new skills and to get better at what we do. What we need is quality instruction, a lot of effort on our part, and a growth (“can do”) mindset, characterized by patience, perseverance, and a little doggedness. With this attitude, combined with effort and quality feedback, progress and improvement are obtainable. P.S. I was out again this morning. Rather than take a lesson, I surfed by myself. Not as successful today! Tired muscles made it difficult to propel myself forward. I also found it difficult to pick the right waves and to catch them at just the right moment. So much to learn! I keep reminding myself that progress is not necessarily linear. I’m trying to be patient and look for signs of incremental improvement. At least I understand why I wasn’t good today. Conscious incompetence is vital to this process. I’ll book another lesson tomorrow before flying home. Michael Griffin, author of Learning Strategies for Musical Success, provides professional development for schools on mindset, metacognition and motivation. His website is professional-development.com.au.